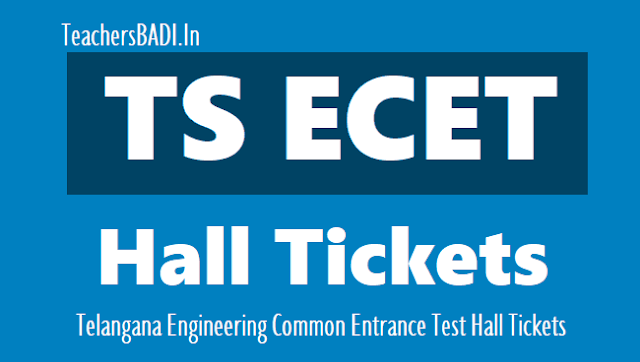 TS ECET 2019 Hall Tickets / Telangana ECET 2019: A Common Entrance Test designated in full as Engineering Common Entrance Test for Diploma Holders and for B.Sc. (Mathematics) Degree Holders and in short as ECET [FDH & B.Sc. (Mathematics)] 2019 will be conducted by JNT University, Hyderabad on behalf of the Telangana State Council of Higher Education for the academic year 2019-2020 for B.Sc. (Mathematics) degree holders. JNTU Hyderabad issued the Telangana ICET 2019 notification on .. March, 2019 and the University invited online applications from the eligible candidates from ..-03-2019 to 06..-04-2019 through online mode at its web portal tsecet.in. Now Online application process is going on upto ..-05-2019 with late of Rs.10000/-. The hall tickets of tsecet 2019 will uploaded on its website by the JNTU Officials. Candidates can download their hall tickets only from telangana ecet web portal tsecet.in. Hall Ticket must be produced at the Test Centre and also in examination Hall, failing which he/she will not be allowed to appear for the test. Hall Ticket must be preserved till the time of admission into the College.